In concept you've probably heard of the Jesus film. The idea of this somewhat aged, movie of Jesus' life being dubbed into a local language and then shown. One of my earliest experiences in this country was trekking up a dangerous muddy road to show the movie to a village. Raised with such films, I had never truly seen the impact that video has on people when they see and hear the story for the first time. There were people openly weeping during this movie. It has a huge impact, especially on those who can not read or have not read the Gospel before. 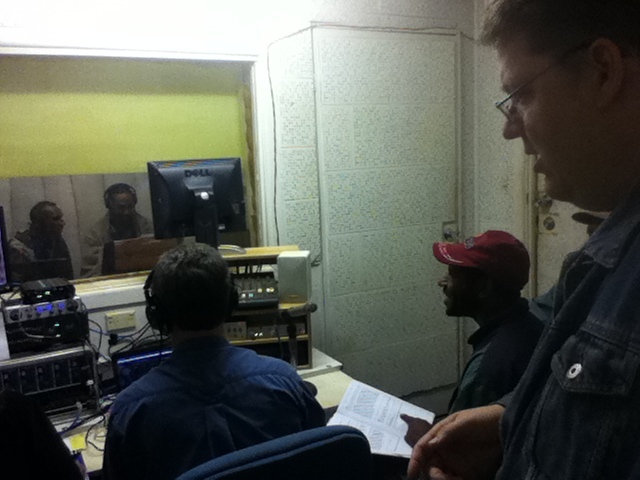 Today I had the incredible and AWESOME opportunity to sit in on a recording session for the Agarabi language. It sparked all of my old juices from when I went to Biola. I instantly understood the equipment. He was using an Intel laptop running Adobe Audition to cue up the video track and then dub new audio. There were two technicians, a friend and his wife, she was managing the edit list, there were two voice talents pictured in the booth there. There was a voice coach (to my right) and there was a translator linguist coach. So a scene was cued up, (everything was run from the laptop, via a usb interface so dual monitors, 1 mic, with a talk back mic)... we played it once in Aramaic, the voice talent listened... then he read his lines and did his thing. If it needed some coaching, then the man on my right here would take the English instruction from the technician at the laptop, then speak into the talkback mic so the voice actor in the room heard it. Then if there was something wrong with the line, the linguist would assist us in translation. It was remarkable. You had audio recording, and editing all happening right there with translation, 3 languages flying back and forth (english, tok pisin, agarabi), it was an energetic mixture of translation, production and some post-production all going on at the same time.